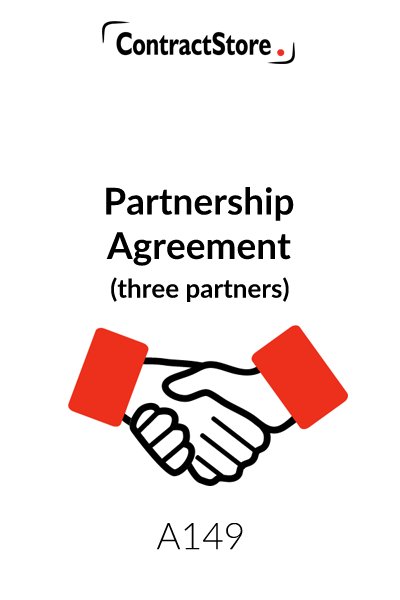 Who can use this Partnership Agreement? 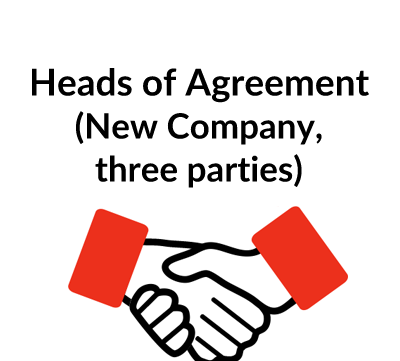 This Partnership Agreement is suitable either for the establishment of a new partnership or for formalising an existing partnership of three partners. What is a Partnership Agreement for? To record the terms agreed between the partners. You need this if you want to establish a three-person partnership, or formalise an existing partnership, and want to set out your relationship to the other parties, your mutual obligations, and the rules governing the conduct of the partnership business. Unlike a limited company, a partnership has no articles of association so the way it is owned and managed needs to be agreed by the partners. What are the main points for a partnership agreement? How much can each partner draw from the income each month on account of their share of profits. Arrangements for annual and management accounts, who has signing rights on the bank account etc. Rules preventing a partner or former partner from competing with the firm. What detailed terms does this Partnership Agreement contain? Yes. All ContractStore’s templates are in MS Word and can be used more than once. As well as filling in the details – names and addresses of the partners, capital and profit shares etc., – you can alter or add to it if you need some special terms. 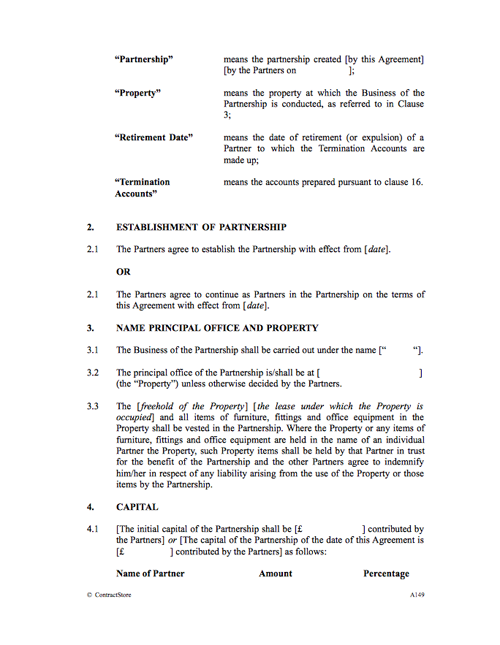 The date to be inserted on page 1 and at the top of the cover page is the date on which all the partners have signed the Agreement. The full names and permanent address of each partner should be inserted on Page 1. The names of the partners should also appear on the cover page. The name of the bank to be inserted in the definition of interest rate will usually be a bank with which the partnership has an account. This clause simply states the date on which the partnership comes into effect. If it already exists, then the effective date of the Agreement will be inserted as per the second alternative. In clause 3.1 the name of the business is to be inserted and in clause 3.2 the head office address should be inserted. Clause 3.3 makes it clear that the premises of the partnership (the “Property“) and office furniture and equipment is held by the partnership. Where the partnership’s premises or furniture/equipment are held in the name of one partner it is made clear that that partner holds that property in trust for the partnership. If there is some other arrangement – e.g. 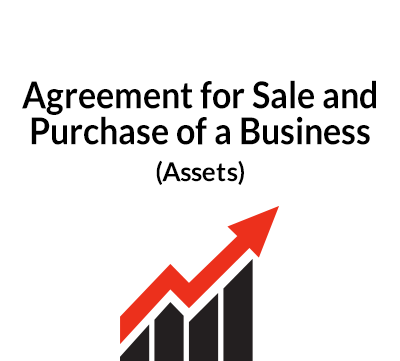 one partner owns the property where the business is carried on and charges rent to the partnership, then this clause would need some adjustment. In this clause the amount of capital which each partner has to contribute should be inserted. The percentage contribution of each partner is also shown, since this can be relevant if percentages are used in relation to voting rights. Under clause 5.2, if there are any expenses which partners might incur but which are not to be treated as expenses of the partnership, then some adjustment to clause 5.2 might be required. It is usual for partnerships to arrange that each partner can withdraw a regular monthly amount on account of his/her share of profits similar to a monthly salary. This clause deals with this matter, and makes it clear that if there is not enough money in the account, drawings cannot be taken. Similarly, any partner who withdraws more than his profit share for a year must immediately repay the surplus – with interest if the words in square brackets are retained. Often, but not always, a partnership will retain part of its profits to meet the anticipated income tax liabilities of each partner and arrange for the partnership’s accountant to settle income tax liabilities with the Revenue & Customs. Clause 6.4 provides that where the tax liability of an individual partner is less than anticipated the balance of any sum reserved is to be returned to that partner. Similarly where a tax rebate is received by a partner in respect of partnership profits he/she is obliged to repay that rebate to the partnership. 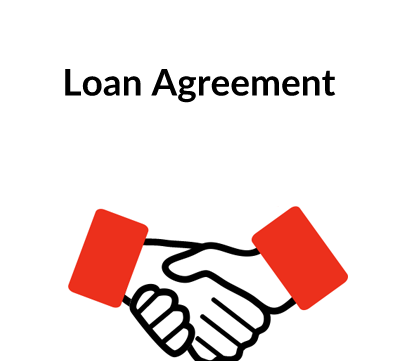 This clause contains a reference to the possibility of one or more partners making a loan to the partnership and in that case, interest at the agreed rate will be payable. Clause 7.2 provides that a loan must be repaid on notice – six months is suggested in our clause. In practice, if any partner does make a loan to the partnership, it would be sensible to have a separate loan agreement dealing with these issues in more detail. ContractStore has some template loan agreements. This is one of the most important clauses from a practical point of view as it deals with the day-to-day management of the partnership, and how decisions are arrived at. In clause 8.3 there is a list of matters which require the consent of all the partners. This list will vary depending on the nature of the business but it is usual for all major decisions, in particular the admission of a new partner, or any increase in capital, to require the consent of all. Under the law, individual partners have joint and several liability, i.e. a debt incurred on behalf of the partnership by one partner can result in any of the partners becoming liable to the creditor for that debt. Unanimous agreement on all decisions of substance is therefore recommended. Under clause 8.4 a majority vote is required for all decisions not covered by clause 8.3. The meaning of “majority” could be a numerical majority – i.e. two out of three partners, or alternatively the “majority” might be the partners who between them have more than 50 per cent of the capital. If the partnership decides to delegate some decisions to an individual partner, it is advisable to require that partner to report to partnership meetings, so that all the partners know what is going on. Clauses 8.5 to 8.8 deal with the procedures relating to meetings and decision making. This clause sets out some general obligations on the partners. Following on from the previous clause, clause 10 imposes a number of specific restrictions on partners: serious harm can be done to a business if one of the partners, without any consultation, makes commitments to third parties, and this clause is intended to avoid those risks. In addition, clause 10.2 requires any partner who fails to comply to indemnify the other partners so that they do not suffer loss. This clause provides not only for proper accounts to be maintained but also for a balance sheet and profit and loss account to be prepared each year. The firm’s external accountants will prepare the annual accounts which will be signed off by the partners. Adequate provision for reserves, etc, will normally be agreed on the recommendation of the accountants and this topic is covered by clauses 12.3.and 12.4. Relevant details need to be inserted here. It is important for every business to have adequate insurance in place. The list in clause 14.2 is indicative only and it needs to be tailored to the business. For example, professional indemnity insurance will normally only apply where the partnership is a firm of professional consultants who might become liable for a negligence claim. If the partnership business is manufacturing, product liability insurance may be appropriate. Note too that the obligation to insure property of the partnership extends to property held in the name of one partner in trust for the partnership. A fairly long notice period, usually at least six months, and sometimes as long as a year, is customary, when a partner wishes to leave. For accounting reasons, it is helpful for the date of a partner’s retirement to coincide with the end of the accounting year. A compulsory retirement age is covered under clause 15.2. Careful thought needs to be given to the selection of a compulsory retirement age as the partnership may face a claim for age discrimination. As a general rule we do not advise opting for a compulsory retirement age under 65. A partner who becomes bankrupt, commits a material breach of the Agreement etc., can be required to leave the partnership if the other partners give him notice. Under Clause 15.5, there is an optional clause for a partner to be asked to leave if all the other partners so decide. In that case a short notice period is probably advisable. Not all partnerships would want such a clause as it could be divisive. This clause sets out the need for a set of accounts to be prepared when a partner leaves and the outgoing partner will be entitled to whatever is shown as being due to him in those accounts. Advice from accountants on the wording of this clause is recommended. Under clause 16.3, while the same accounting principles will be applied to the termination accounts as to the annual accounts, some exceptions might be applicable – e.g. by excluding any valuation for goodwill. Unless the continuing partners decide to wind up the business under clause 18, this clause sets out the period within which the outgoing partner must be paid his share of capital. Under clause 17.3, the outgoing partner’s liability for tax from his share of profits and any liability which is due to some fault on his part are dealt with. If one of the partners leaves, the others may decide to wind up the business rather than pay for the outgoing partner’s share and clause 18 covers this eventuality. Note that the Agreement expressly provides that no one partner may unilaterally dissolve the partnership. It is usual for someone who leaves a partnership to be restricted from taking business or soliciting customers of his former firm. Legal advice should be obtained as a restriction which is too widely drafted may well be unenforceable. By limiting the period of the restriction and confining it to a relevant geographical area can help to ensure its enforceability. It is important to remember that there is no “rule of thumb” as to what will constitute a reasonable and therefore enforceable restriction: this will depend (amongst other factors) on the type of business carried on by the partnership, its size and the local market for services/goods of a similar type provided by the partnership. This clause provides for a three-stage dispute resolution process – negotiation, mediation (but only if agreed) and, finally, arbitration. An alternative to arbitration is to refer the dispute to the courts but in the case of a partnership, litigation between partners could attract publicity and damage the business – arbitration offers a confidential way of dealing with major disputes. See the Free Documents on our website for more details on Arbitration (Z139)and Alternative Dispute Resolution. (Z140). This clause makes it clear that any previous Agreements are of no effect once the partnership agreement has been signed. A “Boilerplate” clause which deals with the possibility of one of the terms becoming invalid for some reason. For information on Boilerplate Clauses see our Free Document Z159. Another “Boilerplate” provision, which makes it clear that if one of the partners is let off the hook even if he has committed some breach of the Agreement, that will not prevent the other partners from later taking whatever action is allowed under the Agreement . Each partner should sign the Agreement in the presence of an independent witness. If every partner wants a signed copy, three copies of the Agreement in its final form should be prepared and all three copies signed by the three partners and witnessed. Note that it is usual in England & Wales for a partnership agreement to be signed as a Deed – in which case the e the signature clause should be worded to this effect – see the alternative wording in square brackets. A deed is a document that is legally binding even if there is no consideration. It used to require the seal of the signatory to be affixed but nowadays all it requires is an independent witness who should sign after the signatory and then add his/her address and occupation. The same individual can witness more than one signature.